On the National Register nomination forms, done many years ago, it was suggested that this house was built by Abraham D. Chenault; land in the vicinity had been occupied by his family since the 1820s. It is thought to be the work of John Cunningham, a local carpenter linked to three other prominent houses in the immediate area. However, recent research by Bob Young confirms that it was actually the home of Abraham’s brother, John Chenault. Abraham’s house was about a mile away and has long-since vanished. The men’s mother died in 1860, leaving the two brothers with title to the property. Abraham moved to Banks County in 1867 where he opened a medical practice with a forged diploma. John stayed in Lincoln County and ran the farm until his death. Mr. Young uncovered much of this information while working on his book, Graball Road: The Story of the Great Lincoln County Gold Train Robbery of 1865. He also has a book about Abraham Chenault, entitled Nish, forthcoming this summer. Notably, Mr. Young discovered that the longtime spelling of Chennault, with two “n”s, is incorrect. The community still bears the fruit of this error on maps and hopefully it will be corrected. The house has always been linked to an infamous ending chapter of the Civil War. As the Confederate cabinet and other high officials were fleeing Richmond, they carried with them the bulk of the Confederate treasury. Almost all of the assets were dispersed to pay soldiers, before the capture of Jefferson Davis at Irwinville on 10 May 1865. Remaining funds were left in Washington, Georgia. The New Georgia Encyclopedia notes: A detachment of Union soldiers set out to divert this specie to a railhead in South Carolina. The wagons stopped for the night at the Chennault (sic) Plantation and it was here that on 24 May 24 1865, bandits attacked the wagons and $251,029 was lost. Bank officials eventually recovered some $111,000 of the stolen money. Union General Edward A. Wild led a search of the area for more gold and earned notoriety for the arrest and torture of the Chennault (sic) family, who Wild believed were hiding gold but who turned out to be innocent. As a consequence, Union General Ulysses S. Grant removed Wild from his command. Mr. Young also notes that the celebrated robbery occurred on the farm of David Moss, about a mile away. 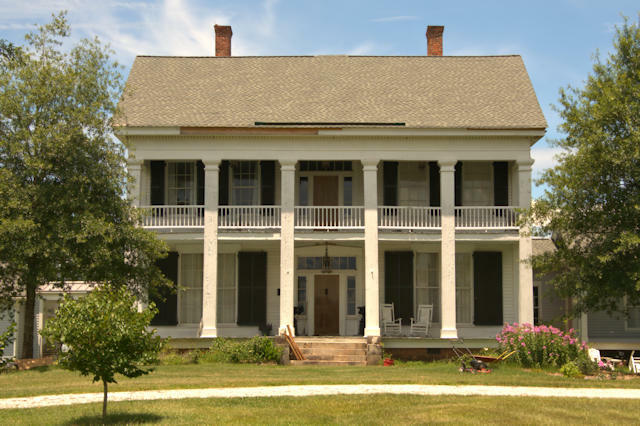 The robbers are believed to have camped on the Chenault Plantation, where they returned and remained several days after the heist. In the century-and-a-half since the end of the Civil War, historians and fortune-seekers alike have sought the lost Confederate gold. Where it is or whether it even remains will always be Georgia legend.